The RME Fireface 800 was the first FW device, which was no worse than the external RME interfaces that required a digital PCI or Cardbus controller for a PC connection. According to the manufacturer, the Fireface 400 is not just the little brother of the Fireface 800. It is a completely newly designed device. It is the only device in its class with active jitter suppression, stand-alone functionality, complete controllability from the front panel, highly flexible I/Os in professional quality, and an unsurpassed 648-channel matrix router - at sample rates up to 192 kHz. The DSP-based TotalMix mixer allows fully independent routing and mixing of all 18 input and output channels to all 18 physical outputs. Up to 9 totally independent stereo sub-mixes simply mean unrivalled monitoring facilities. The mixer can be completely MIDI controlled via the Mackie-compatible controller. Eight ADAT channels are available simultaneously with the analog channels. The coaxial SPDIF I/O , which is fully AES/EBU compatible, also works up to 192 kHz. This device uses the latest two AKM AK4620A stereo codecs that unite DAC and ADC in a single package. The AK4620A is positioned for professional sound cards, DAW, and other equipment. The codec supports up to 24-bit 192 kHz for recording and playback. Signal to noise ratio is 100 dB, dynamic range - 113/115 dBA. The DAC uses the AKM Advanced Multi-Bit delta-sigma architecture to obtain low modulator noise - practically flat noise spectrum up to 80 kHz. Filters at switch-selectable capacitors provide resistance to jitter of the master clock. The ADC has the AKM Enhanced Dual-Bit architecture to reach a relatively large dynamic range. There is a digitally controlled (IPGA) amplifier at the input. Digital filters have a linear phase. Although the Firewire interface looks very attractive and provides high bandwidth, it poses some problems in the audio tasks. Immediate access to data and maximum speed of transferring sound buffers in small chunks are more important to sound devices than theoretical bandwidth. It's also important to have as little overheads as possible - bandwidth losses to transfers of ancillary data of standard protocols. CPU load generated by the interface also plays an important role, it has a direct effect on the minimal signal latency. It's praiseworthy that RME have a special section in the official web site (Technical Background) to publish some technical details. The manufacturer explains that there are fundamental differences in the RME architecture and Firewire products from other manufacturers. External audio Firewire devices usually use a general-purpose Firewire chip and a separate I/O controller with minimal functionality. 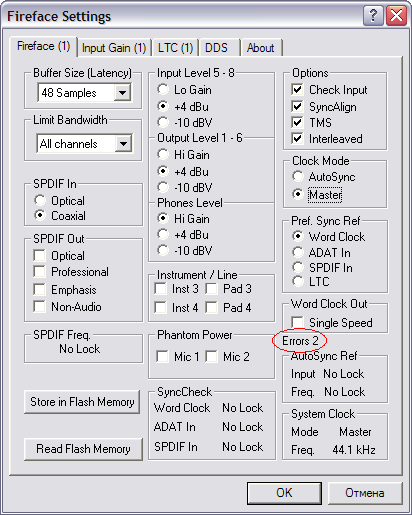 Manufacturers sometimes add a DSP effect processor. But there appears a problem of limited data exchange rate between a device and a computer along the entire interface chain. Thus, the standard approach leads to a limitation on the number of simultaneous channels as well as on the signal transmit time. RME designed a proprietary solution for the Firewire interface. The core is packaged into FPGA, which allows to improve its performance and fix bugs by updating its firmware. DSP is implemented inside FPGA to process routing signals in TotalMix or to measure signal levels. On the physical level, the company uses Texas Instruments chips - the best solution for the Firewire interface. In order to avoid problems, it's also recommended to use a TI-based firewire controller to plug the Fireface. The RME web site publishes a list of recommended and inadvisable controllers. The latter are manufactured by unknown Chinese manufacturers with serious mistakes in their circuitry. The drivers support the following operating systems: Windows 2000 SP4, XP, XP 64, Vista, Vista 64, Mac OS X, and Mac OS X x86. Firewire devices can be powered up and shut down any time (hot switching). Since its appearance, this advantage of Firewire have misled many people and caused the death of a great many devices. Web research brings up innumerable numbers of hard drives and computers that were damaged when users connected interface cables. The main problem is that the Firewire cable also has power wires. Brief voltage surges appear when you plug or unplug a device. They break through wire isolation and damage delicate electronic components. Of course, this problem can be minimized with special measures (protective diodes at the input, smooth power supply, etc), but it cannot be eliminated. Hot switching always poses a threat, if a device is powered from the bus. So RME recommend avoiding hot switching! Plug the Fireface 400 to Firewire only when a computer and the Fireface are powered off. And you will avoid the above-mentioned problems. RME offer an easy way to differ between clicks caused by CPU overload (which is solved by increasing the latency/buffer size), and the loss of complete FireWire data packets. The FireWire communication between PC and Fireface includes watermarking of the packets. The Fireface is able to detect whenever and how many packets got lost. In practice, data losses are rare. We used the Beyerdynamic DT-250 headphones with the nominal impedance of 80 Ohm for immediate alternate comparison of the headphone output in the E-MU 1616M and the RME Fireface 400. The devices worked with the ASIO interface, volume was controlled only with audio interface tools: analog volume control in the E-MU and digital volume control in the RME mixer. No matter how hard we tried, we've heard no audio difference, the E-MU sounds insignificantly better. But we've heard the difference between the 1616m and other equipment (read the details in the article ECHO Audiofire 4). Some sound producers wonder why crisp clear tracks are messed up in the final mix. Despite the lack of intelligible arguments, sound producers have a theory that mixing audio with hardware devices yields higher quality, a more detailed mix. Many of them start voodoo manipulations with software and digital mixers to find a panacea, because there exists an idea about some "ideal mixer", which allows to avoid the labor-consuming equalization stage and other track processing tasks. Besides, we've heard them discuss which programs merge tracks clearer. 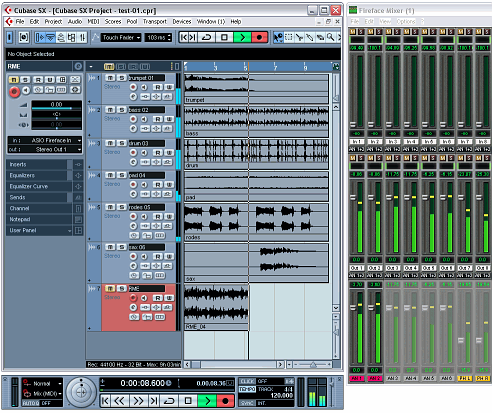 The article about ProTools compared Cubase vs. Samplitude vs. ProTools by ear and with a spectrum analyzer. We came to a conclusion that the track sums matched - differences came down to dithering noise added by default to remove sampling distortions. We used the same composition as in the article about Protools M-Powered. We chose crystal clear tracks prepared by Grigory Liadov in order to detect differences in audio mixing quality. The track rerecorded through the Fireface Mixer was compared with the Cubase SX3 downmix. We recorded audio in the 32 float format. The file recorded by the Fireface is offset by 1.7 ms. This is time compensation necessary for DAC/ADC. The driver sets latency for the editor to make up for the offset. In a digital loopback test a negative offset occurs, so you should compensate the offset manually within the application. It's mentioned in the manual. First of all we tried to hear the difference between mixes by ear. But we failed. Subtraction of two signals gives very low uniform noise. This error signal resembles 24-bit dithering noise. It's impossible to hear this difference, so we didn't. Is hardware digital mixing more precise? What are peculiarities of this approach? Hardware mixers in audio interfaces use programmable DSP with limited processing speed and evident real-time computing optimization for many channels with minimal delay. These architectural limitations put the CPU downmix in sequencers to the first place in computing precision. Especially if we recall the unlimited time for computing when a project is downmixed into a file, 64-bit floating point variables and 80-bit FPU registers of the coprocessor. RME's mixer uses integer arithmetic with a large overload margin (42 bit) and 24 bit at the output (limiting and truncating bits above 24-bit), without dithering at that. All these advantages are really interesting compared to real-time mixers of universal audio controllers (VIA/IC Ensemble, Motorolla, Philips), but not compared to FPU x86 (software sequencers with 64float mixing). Compared to High-End equipment, the LynxStudio mixer is based on the same framework (Xilinx Spartan) and allows to enable/disable dithering. It's probably done on the level of drivers. You must understand: every device has its use, hardware features must be used for their designated purpose. RME have never said that a hardware mixer should be used to downmix compositions, but no one stops you. However, there are a lot of situations when the use of the RME mixer is justified. For example, if you want to apply different mixes to different inputs (Submix mode), especially in real time and with external sources or sends/returns. Along with channel selection for each output, you can adjust their levels. It can be done in the Fireface Mixer as well as in the Fireface Matrix. In this case the quality is excessive. Such extended functionality (for example, an option to create separate submixes) is available to this or that degree in the LynxStudio, MOTU, and ECHO professional interfaces. But the ESI, E-MU, M-Audio lack this functionality. Whether it's a significant advantage depends on your tasks. Requirements of home studios differ much from those of professional sound recording or television studios. Your choice (preamps/converters of higher quality or usability and speed) depends on a given situation. Like any device, the RME Fireface 400 has its pros and cons. For example, the mixer is an advanced tool, but it has a steep learning curve. So you'll have to study the manual. By the way, the bundle includes a thick printed manual. Another controversial point is the mixer design in the style of old Steinberg Cubase 5, you cannot scale interface elements. So the mixer is overloaded with elements and looks small in high resolutions. The most convenient option is MIDI control of the mixer via a Mackie-compatible controller. If you use it actively in a studio, you can open the mixer window on a separate monitor. When several Fireface devices are connected simultaneously (up to three units), the mixer view can switch between them. 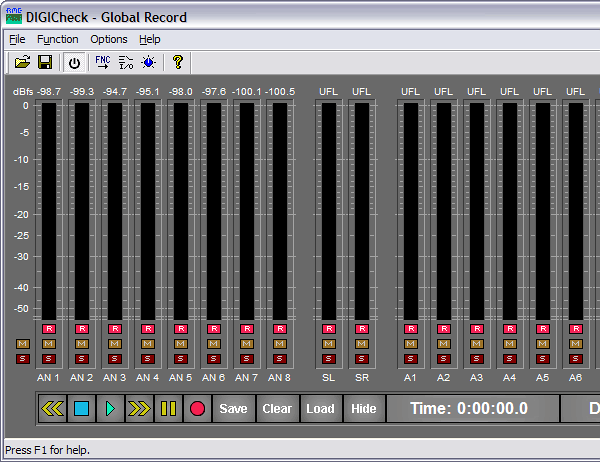 For example, the LynxStudio (I use the LynxTWO and Lynx AES16) can display all mixers at once. Perhaps, it's not important, but this device can still be improved. Matias Karstens and his team know well about strong and weak points of their products and choose their priorities, I guess. It's clear to those who have experience in developing such software. The RME web site has an interesting free utility (DIGICheck), which offers various analysis modes for signals from I/O channels. These features significantly expand functionality of the mixer. We'll focus on the most unusual issues. The spectrum analyzer does not use FFT. 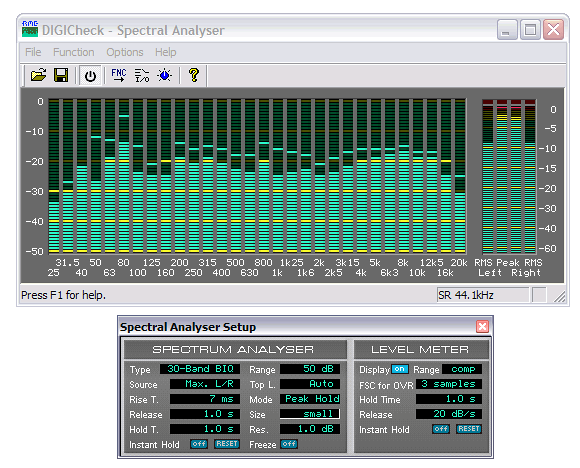 In return, it uses band filters in the style of a hardware analyzer. The analyzer has a logarithmic scale. There is another interesting mode - Global Record. It's used to record a lot of channels in a single stream to a file with minimal system load. It's important for the MADI card with 64 channels in the first place, where recording audio into different files generates an excessive load on a hard drive and the system. It results in fragmentation and unpredictable data drops, especially in the course of prolonged important sessions. Pyramix uses the same method. Single-stream audio recording with not many channels has got a second life with notebooks and their weak CPUs and hard drives. The LynxStudio Aurora 8 was used as a reference device and a switchboard to reroute signals to the ADAM S2.5A monitors. We've carried out an experiment in order to find out whether the Aurora analog section distorts signals from devices - we compared the signal at the monitors with the signal routed through the Aurora. We've heard no difference, as in case with changing Aurora channels. But signals from connected devices were noticeably different. Our tests were carried out by our test procedure, which complies with AES20-1996/2002 in many respects (it's available for AES members). AES20 requires double blind tests (DBT). (AES20-1996/2002 7.10.1.) They must be based on recordings with recognizable tones of musical instruments without heavy sound processing. (AES20-1996/2002 6.2.2). Test fragments must be approximately 10 seconds long, a pause between fragments must not exceed 5 seconds, then you must switch to the original track and back. The longer is the pause between fragments, the less adequate the results, because the man does not have long-term aural memory. If the pause is long, only emotional reminiscence remains, no audio details can be recollected. The volume of compared signals must be absolutely identical. We also used a ready commercial project to test the Fireface 400 in professional sphere: adjusting effect levels in a downmix, changing instrument tones in different tracks. In this case we test how adequately the section can reflect the smallest changes in a sound track. The RME Fireface 400 interface demonstrates high professional audio quality. There are no tonal distortions, a good detailing level. The Fireface 400 outscores the ESI Juli@ and is slightly inferior to the 1616M and Aurora 8 in quality of the analog section. You can also consider the Fireface 400 as a cheaper modification of the Fireface 800 with the same functionality, but with fewer analog interfaces and converters of the high but not top level. Nevertheless, quality of the new codecs pleasantly surprised us even as we tested the ECHO Audiofire. Devices based on the AK4620A outperform units with separate converters offering similar characteristics. We have information that RME initially planned on using separate DAC and ADC. But having heard the quality of new AKM codecs, they were impressed and decided to use them. Anyway, if you choose higher quality of the audio section and more mic-ins, you should choose the Fireface 800 (119 dBA). This device also demonstrates advanced functionality for recording. When two capacitor microphones were plugged, one of them (usual) required phantom power, the other (tube model) was powered from its own PSU. The RME Fireface allows to apply phantom power only to one microphone input, while many devices apply +48V to all inputs at once to facilitate the design process. When you work with the mixer, it's convenient to see exact values (to within 0.1) of faders as well as peak meter values of channels. The latter offers flexible and really useful settings. For example, it allows to choose a meansquare/peak level with a 3dB RMS compensation. These values are computed not by the driver, but by the built-in hardware DSP. We test the RME Fireface 400 in loopback mode, so that we can compare its results with other devices. Readings with the Lynx Aurora are close to the data published in the specifications. The noise level is -113.2 dBA, while the specs mention 113 dBA. 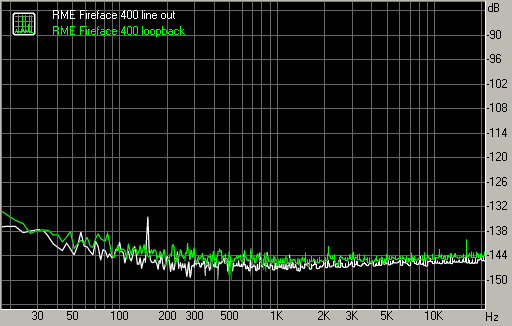 THD+N at the 5/6 output is 98.7 dB (unbalanced), this value also matches the one in specs (<-96 dB). The level of harmonics on the distortion graph is plotted for -3 dB FS, while the value depends much on the amplitude. It's the worst case, distortions for input and output separately are lower, they match the ones published in the specifications. We should also examine the question of jitter and its suppression. The Fireface 400 uses a digital reference generator, which gives flexibility in finetuning playback speed in professional applications. According to the specifications, the interface jitter is low, and the spectrum is uniform. But purists interested in extremely low jitter will prefer devices based on a high-quality crystal oscillator with a fixed reference frequency. The Fireface 400 is not designed for audiophiles, its architecture is not optimized for that. It's not justified to use this device as a stereo interface for audio output. Leaning upon the article "Jitter. Theory. Part 3", written by Julian Dunn, published in Audio Precision, we can analyze loopback vs. line out graphs. 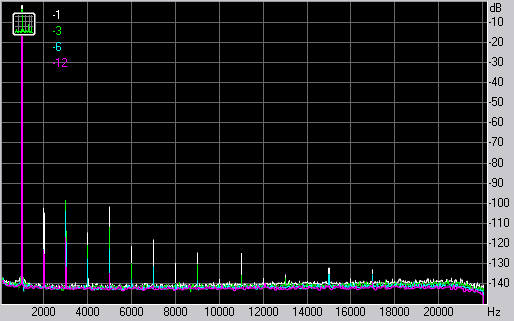 Our tests reveal decreased rms of the dynamic range at several dB with a test signal because of a wide-band jitter. It may be the cost of the digital tunable clock oscillator. 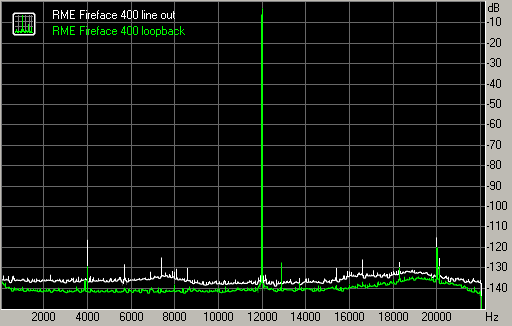 Clock oscillators of playback (RME Fireface 400, 800 ps) and record (Lynx Aurora, 20 ps) devices were not synchronized. The difference between the signals on the graph and the 12 kHz sine is definitely not noise or interferences, because the noise threshold is expectedly higher on the noise graph in the loopback mode. It's a good test, but it requires two devices, one of which should have a more precise clock oscillator. In this case the results are beyond our hearing, considering the wide-band spectrum - just like in the specifications. If we compare results of the Fireface 400 with those of the ECHO Audiofire 4, the ECHO has more problems with low-frequency jitter. Fortunately, even such problems of the Audiofire 4 do not affect the resulting audio quality - jitter grows exponentially to frequency. 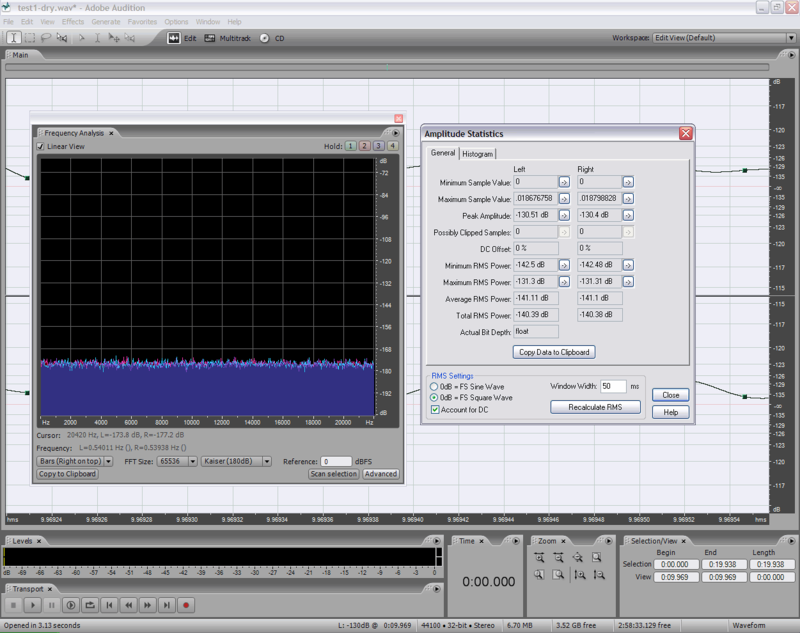 We must always combine measurements with psycho acoustic aspects of perception - LF jitter is beyond hearing up to 200 ns. We've heard no problems of the Fireface 400 with jitter. Differences from the other devices are conditioned only by the converters. Measurements with the APS2 show that they determine signal/noise of a device and distribution of its harmonics. As it's difficult to stick to the principle of reasonable sufficiency, many beginning sound producers and computer musicians seek devices with incredibly high parameters, while the rest of the audio section, monitors in the first place, do not match even the cheapest interface. But they won't hear any difference between converters of the mastering level and semi-professional devices. Functional peculiarities and usability reserve unpleasant surprises for later. In this respect, the RME Fireface 400 seems to be sufficient for 90% of High-End equipment in terms of its analog section quality. Its functionality and convenience are sometimes much higher than in its competing products. Besides, although the price of the RME Fireface 400 is not quite affordable for enthusiasts, it can be recommended to commercial studios even with low budget. Features of the Fireface will be excessive for beginners who own only "monitoring" headphones for $100. They'd better choose simple dual-channel interfaces for $150 from manufacturers of semi-professional equipment. They should acquire some experience before they start using a hardware mixer in stand-alone mode, multi-channel recording with individual submixes, as well as a logarithmic analyzer, time-code support, and other things. The RME Fireface 400 is not an advanced modification of a cheap interface for an impressive price, which will demonstrate striking quality with the $100 audio section and will automatically downmix your composition with a hardware mixer. It's a professional tool for those people who really need it, in the first place.